Teaching excellence in higher education needs to be promoted and celebrated. However, a universal definition of excellent teaching remains elusive, and robust evidence about how it affects student learning appears to be lacking. 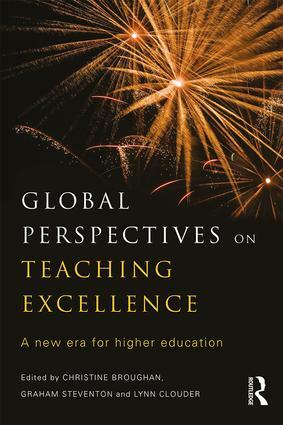 This timely book explores the notion of teaching excellence from the viewpoint of a variety of international authors; guiding the reader to understand the complex terrain in which teaching excellence is foregrounded, and highlighting a number of key issues facing the future of global higher education. what is meant by teaching excellence, whether it can be measured and if so, how? the impact of teaching excellence frameworks, initiatives and awards. the new challenges for delivering global teaching excellence fit for the 21st century. With a mix of political, theoretical and applied research foci, each chapter also includes a short critical commentary from international experts in the field to further the debate and situate the topics in a wider context. Global Perspectives on Teaching Excellence is essential reading for academic and education policymakers, researchers, and undergraduate and postgraduate students in education. What outcomes are we trying to achieve from excellent teaching and why are they so difficult to measure?